each of our pieces is a unique work of art. "Fermented ceramics is a 4-6 centuries old ceramics technology where the glass-like glaze enriched with metal oxides is replaced by rye-flour yeast." The process starts out with a slurry that reminds one of stale beer and ends up smelling like a lovely LickinFlames bread. "A SAGGAR is a fireclay container, usually oval or round, used to protect pottery from marking by flames and smoke during firing in a bottle oven." Of course at LickinFlames we don't do anything like it was originally intended to be done. Carbon Painting with feathers and horsehair are dramatic techniques. We use a variety of feathers but where LickinFlames gets the horsehair is just too cool. 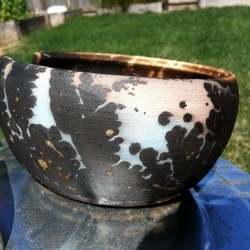 Raku in its Eastern form would be a simple technique, closely associated with Zen and tea ceremonies. However, this is not the same raku that we use at LickinFlames.